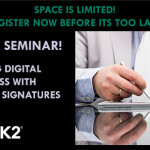 Join inFORM Decisions, K2 and DocuSign for a Breakfast Seminar at the Microsoft Technology Center in Irvine, CA. 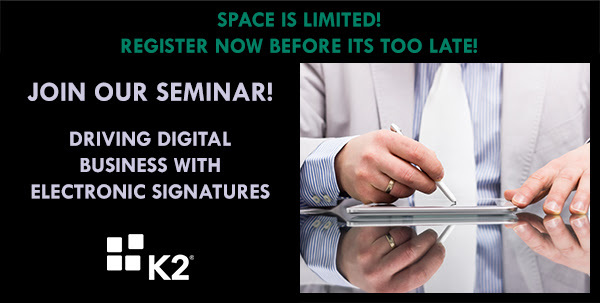 This informative event will consist of three unique 45-minute sessions covering legality issues, integration points within the context of business process management, as well as showcase a live demonstration of these capabilities. There are only 30 slots available for this private event, so register today! For more information on IFD solutions, contact inFORM Decisions at 800-858-5544, email info@informdecisions.com or visit us online atwww.informdecisions.com.